CORRECTION: Yesterday's announcement had the candidate's name spelled wrong in the headline. It is Robertson, with a T.
Shoreline City Councilmember Betsy Robertson is hosting her first campaign kickoff this Thursday, April 18th at 6pm at Cafe Aroma. In January, Betsy was unanimously appointed to the Shoreline City Council and is now running to retain her seat. 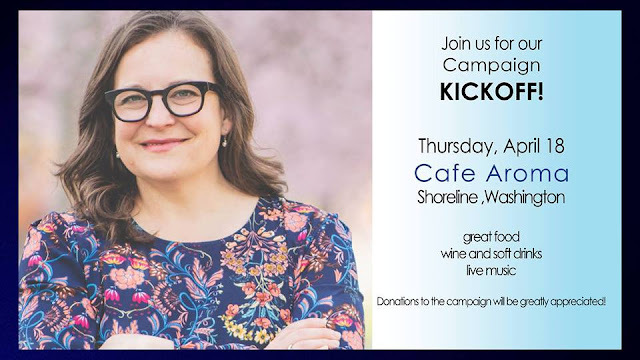 "I hope to see everyone at Cafe Aroma on Thursday," Councilwoman Robertson states, "Getting to know Ed and Arta at Cafe Aroma has been a real highlight of my years in Shoreline. Their business is a real success story. I am honored to have their support in my race." Prior to Betsy being on the city council, she served on the Parks, Recreation and Cultural Services/Tree Board. She wishes to expand our public green spaces and work to keep the historic character of Shoreline. Her husband is going to be grilling food and playing music for all the neighborhood to enjoy. "We hope to see you there!"